Standing upright and shining down upon Earth on these midwinter nights is the brightest and grandest of all the constellations: Orion, the Mighty Hunter. Currently, Orion can be easily seen by skywatchers with clear weather as a star pattern standing high in the southern sky at around 8 p.m. local time. Three bright stars in line in the middle of a bright rectangle decorate Orion's belt, which points northward to the clusters of the Hyades and Pleiades of Taurus, and southward to the Dog Star, Sirius. 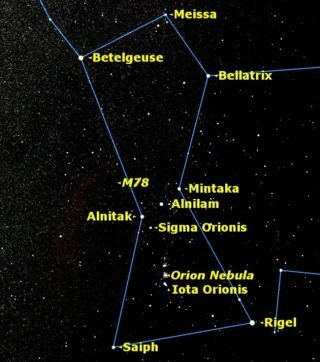 Above and below the belt, we also find two immense stars, Rigel and Betelgeuse. Rigel (the "Left Leg of the Giant"), is a blue-white supergiant star, one of the rarest breeds in our galaxy. But with their enormous brilliance — up to 100,000 times as bright as the sun — blue-white supergiants remain conspicuous over great distances. Rigel is one of the most intrinsically luminous of all stars and one of the hottest, apparently just reaching the prime of its life in the time span of a star and literally "burning the candle at both ends." It has been computed that Rigel's luminosity is something like 57,000 times that of the sun. The star is about 773 light-years away. In stark contrast, bright red Betelgeuse is near the end of its career. It is located 522 light-years away, but does not shine with a steady light. Betelgeuse is a "pulsating" star, expanding and contracting spasmodically with a diameter that varies from 550 to 920 times that of the sun, but so irregular are these pulsations that no one can predict exactly when it will expand or contract. In trying to describe Betelgeuse many years ago, Henry Neely, a lecturer at New York's Hayden Planetarium, once noted that it is "like an old man with his strength almost entirely spent, panting in the asthmatic decrepitude of old age." Stars produce their energy by fusing hydrogen into helium deep within their cores. When a star accumulates sufficient helium in its core, its energy output increases significantly, and it swells into a red giant or supergiant, like Betelgeuse. This is what Rigel will become in a few million years. In such stars, the core produces successively heavier elements to balance the incessant crush of gravity. But once the core begins creating iron, a star's days are numbered; the formation of elements heavier than iron consumes rather than produces energy. Ruddy Betelgeuse and bluish Rigel provide an excellent color contrast, but we can easily find other colors as well. Look at orange-ish Aldebaran and yellowish Pollux. And considerably removed from the winter groupings is brilliant topaz Arcturus, usually regarded as a spring star, but now, in the dead of midwinter, rises this week between 9 and 9:30 p.m. and quickly holds forth in solitary splendor in the east-northeast. Even as you observe these stellar colors, do you notice that they're recognizable only for the brightest stars? This is due to the physiology of the eye, and more specifically, to the fact that the color sensors on the retina — the cones — are insensitive to faint light. Under dim illumination the retinal rods take over. But their greater light sensitivity is offset by their color blindness. This is why we see all faint stars as white.